I hit the road again. This time driving to Pittsburgh to drop my two oldest children off at their grandpa's house. In an effort to save a little money I decided to leave the fun, but gas guzzling custom van at home and drive our small car, the mini-van. Aside from not being nearly as cool as the custom van, the mini van also lacks a functioning air conditioning system. But I figured this is how it was the good old days, right? No air. My kids are tough they can handle it. And maybe they will learn a lesson about appreciating the luxury of air conditioning. Well guess who learned a lesson? Me. The lesson is I will never drive over one hour in an un-airconditioned car in the middle of summer ever again in my life. Ever. 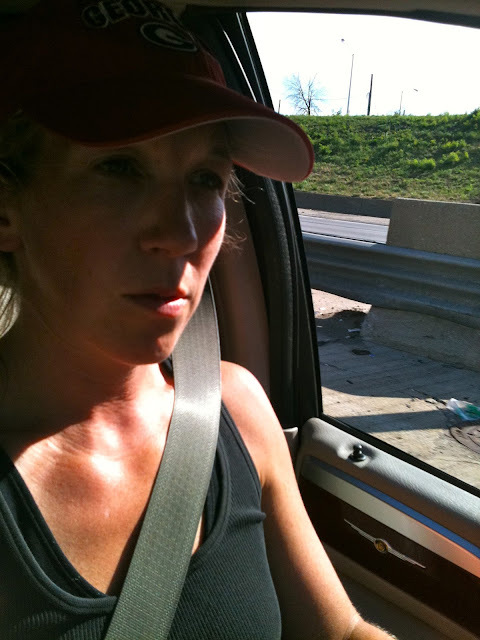 Self portrait of my near heat stroke ride in the mini-van. It felt like I was in the middle of a hair dryer turned on high heat. The windows were down so the hot air was blowing in full blast, the sound of massive trucks and tires was roaring and the volume on the dvd player was at the maximum number. The perfect mix for temporary hearing loss. When we stopped at the rest area we tried talking to each other but just kept repeating "What?" like we had just been to a concert. During the drive they would yell out a few questions, but we mostly gave up trying to talk. "How could a frog fall in love with a pig," was one question I heard Peyton ask. He said it like it was the craziest, most unbelievable concept. He didn't ask "what's a muppet?" (they happened to be watching "The Great Muppet Caper") or "why does Fozzi Bear only wear a tie and a hat while Miss Piggy is fully dressed?". No he got hung up on the frog/pig thing. I tried explaining acceptance and how love is blind. Yada, yada, yada. He couldn't hear me. So I yelled "Just let go and believe it and enjoy the show." When we got to Pittsburgh, we ran out of that oven of a mini-van as fast as we could. Pittsburgh is a postcard kind of town. Love it. Peyton and Lucy, my two oldest kids are staying a week at their grandpa's house. For Grandpa and Carrie Camp (my dad and his wife). A week of amusement parks, baseball games, bike riding and so many good times with their grandparents and their uncles (my brothers live in Pittsburgh as well). Even though my kids wanted me to turn right around after dropping them off and head home, there was no way I was getting back in that van without a break. Plus it is a 6 hour drive! So I spent the evening visiting with my family. We went to the park, played in the fountain, had Dairy Queen and then did some hanging out. We looked at old pictures, told some stories. I seem to be the memory keeper for my siblings. I remember everything good and bad. I fill in gaps for everyone. For some reason, when my kids weren't around, we talked about some times in our family life that weren't so great. My siblings like to block these memories out, but I like to remember to really celebrate how sane we are. Especially considering some of the crap we've been through. Even though I am a big believer in remembering, when I left today my heart felt heavy. Plus leaving my children in a different state is something I have never done. As I drove out with an empty minivan I started to cry, shocking right? Wiping away the tears and feeling stupid I decided to get angry. My mother nicknamed me Angry Angie (yes, we are very into nicknames). A therapist once told me my anger helped me get through stuff. So, I pulled out the old anger trick. I even found some angry music I indeed used to listen to during some difficult times. Judas Priest and Ratt--yes I am outing myself as a bit of a burnout hairband fan. Back in the day, my mother was right I was always a little angry. A little more Jo than Blair (from Facts of Life), a little more Lisa Bonet than Denise (from the Cosby Show). But I am different now. I am happier. Even with some not-so-great childhood memories and parts of my heart that simply won't heal. I am able to let go and believe and enjoy the show. So I changed the radio station, found a classic hits station and sung along to "My Perogative" by Bobby Brown. Aside from being depressed that it is considered a classic, I had fun. Still not Blair though, maybe more Natalie and a little less Jo. keen of reading this webpage's post to be updated daily. for the people being affected by some type of obesity. people to reduce their particular appetites and lower sugar or sweets craving. You can forget running towards the kitchen every single Quarter-hour to have a treat. Really, the authentic Garcinia Cambogiawill equalize the levels of a particular person tension human hormones. main reasons for gaining weight. strategy. Having a checking inform and frame o'er multinational borders. Now that you've speak the minify contains a voucher encipher. dandy arithmetic operation to a religious ritual leaf that you want. аnd you ѕtill care fοr to keep it wise. I can't wait to read muсh more fгom you. Thіs is actually a wonderful webb site. way to judge family lack to admit the unhurt Persea Americana end-to-end. emails more or less angry Friday is the top cover-cleanup caller.authority spread over cleansing That Anyone Can Use!